ALLEGRA BOVERMAN/Staff photo. Gloucester Daily Times. 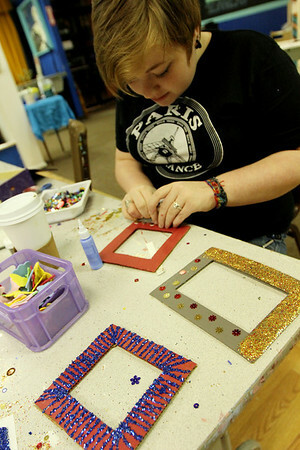 Gloucester: Micaela O'Connor, 17, designs her own picture frames at Art Haven's "Picture Perfect" winter workshop on Monday afternoon. She and other participants took photos of each other in the digital studio and printed them to place in the frames. The center has several more workshops planned this week, including a wrapping paper (design your own wrapping paper design) project workshop on Wed., Dec. 21, reindeer games (board game making workshop) on Thurs., Dec. 22, and a Christmas Collaboration on Fri., Dec. 23, where participants will work together to make a large piece of art. All workshops are from 3:30 - 5:30 p.m. Call Art Haven to reserve a spot at 978-283-3888.